“WASHINGTON — When House Republicans voted resoundingly earlier this month in favor of a bill to dismantle protections for young undocumented immigrants, House Democrats vowed they would make sure it hurt Republicans politically. That was largely a longer-term threat, based on the Republican Party’s Latino voter problem and the possibility it could doom GOP chances in the 2016 presidential race. In general, the Latino vote isn’t expected to swing many races this year. But Colorado contests might be the exception, and Republican politicians there seem to know it. Reps. Cory Gardner and Mike Coffman were two of only 11 Republicanswho opposed the House bill to gut protections for Dreamers, undocumented immigrants who came to the U.S. as children. Both have also softened their rhetoric on immigration, despite having opposed attempts at comprehensive reform before. Democrats and progressive activists in Colorado have made immigration reform a key issue in the campaigns against Gardner, who is challenging Sen. Mark Udall (D), and Coffman, who is running for re-election. They don’t plan to let either candidate off easy for his prior statements and positions on immigration — regardless of the recent vote for Dreamers — as they aim to bring out Latino voters in November. 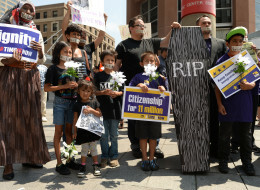 America’s Voice, an immigration reform advocacy group, is currently working on the ground in Colorado. Latinos make up 14 percent of the eligible electorate in Colorado this year. They are 20 percent of the vote in Coffman’s district. In an election cycle without a single dominant issue, immigration is competing for airtime against a host of other topics, from health care to foreign policy. But activist organizations in Colorado, both those that push for immigration reform and those that work on Latino voter outreach, believe that immigration may make a difference in November. According to The Denver Post, the race between Coffman, a three-term incumbent, and Democrat Andrew Romanoff, a former Colorado House speaker, is “one of the few competitive House races in the country.” As for Gardner’s effort to oust Udall, theHuffPost Pollster analysis, based on available public polling, has shown the candidates within 2 percentage points of each other for months. In particular, these advocacy groups aim to educate voters on the Republican candidates’ mixed records on immigration reform. For instance, while Gardner may be attempting to move toward the middle on the issue, he voted for a 2013 bill, introduced by Rep. Steve King (R-Iowa), that would have ended Deferred Action for Childhood Arrivals, the Obama administration policy that gives Dreamers a break on deportation. Gardner’s campaign did not respond to a request for comment on criticism of his immigration positions. Immigration reform advocates have similarly accused Coffman of shifting his stance for political gain. Coffman’s district was redrawn in 2012, resulting in a more diverse demographic makeup. Two years before, he had voted against the Dream Act, which would give legal status to Dreamers. Just this week, the Colorado Democratic Party went after him for joking about possibly being deported. Coffman campaign spokesman Tyler Sandberg said the congressman is committed to finding bipartisan solutions to immigration reform, citing two bills that Coffman introduced this year with bipartisan support. “He is frustrated with leadership of both parties for their inability to find a path down the middle to fix our broken immigration system,” Sandberg said. While progressive advocacy groups are focused now on the 2014 elections, they see Colorado as a microcosm of the bigger immigration battles that might play out in 2016. Between now and then, the groups argue, Republicans will have to strategize how to reach out to Latino voters on immigration — or risk alienating them completely. “They’ve pigeonholed themselves into a completely untenable position, and they have nothing to do but run away,” she said. Voter education for Spanish-speaking citizens is a big part of the advocacy groups’ political efforts. ProgressNow Colorado created candidate accountability websites in both English and Spanish and is planning Spanish-language billboards that will show where candidates stand on immigration reform. This month, the Democratic Congressional Campaign Committee began running Spanish-language ads targeting Coffman. “Failure! Congressman Coffman is part of the problem, and his leaders are hurting our DREAMers. He’s failing our community. Shame on him!” the ads read. Other groups are focusing on grassroots tactics. Mi Familia Vota, a nonpartisan organization that supports immigration reform, is encouraging voters to attend town halls during the congressional recess this month, according to its Colorado state director, Carla Castedo. Kupfer said one big challenge is translating Latino anger over congressional inaction on immigration into actual votes. Traditionally, voter turnout is lower in midterm elections, and voters have multiple issues on their minds this year. Castedo, however, thinks the fact that immigration policy personally affects the Latino community is enough motivation to turn out and vote.